Once you’ve successfully verified the installation of the Tracking Code on your website and set-up either Analytics or Feedback tools, Hotjar will begin collecting data in real-time. Processing occurs right away so you can expect to start seeing results within 60 minutes. Processing time: Our systems will typically process data within 15 minutes. Page targeting: Are you using advanced page targeting rules that haven’t yet been triggered by users? 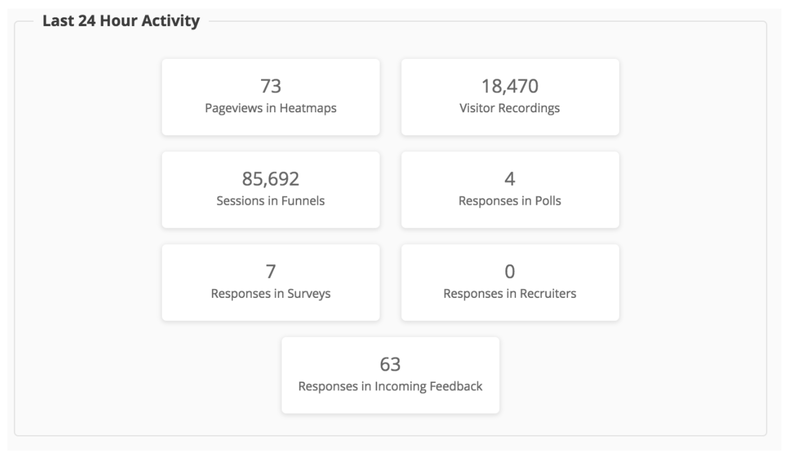 Not tracking of visits with no activity: For Recordings, Forms, and Heatmaps, Hotjar doesn't save data with no tracked usage. If the visitor doesn't interact with the site and leaves immediately, we do not collect data on this visit to avoid clutter of un-insightful data.